Believe it or not, buying a home doesn’t have to be a stressful, drawn out process. Whether you are buying your first home or you are a well-informed real estate investor, you need a professional who knows the Orlando real estate market inside and out, and most importantly, knows how to negotiate and handle the real estate transaction on your behalf. Now that you have an overview of the Home Buying Process, let’s look at each step a little closer. Did you know that 78% of home buyers prefer a quality neighborhood over the size of their home? According to National Association of REALTORS® 2016 Community Preference Survey, 78% of home buyers surveyed responded that neighborhood quality is more important than the home size. We agree, the “Neighborhood First” approach is best when looking for your new home. For this reason, we specialize in providing the resources and guidance necessary to locate and choose the best neighborhoods for your new home. Are You Ready To Buy Your Home Now? If you are ready to start your home search now, you can search all available homes for sale on Orlando’s MLS IDX service on your own. Contact us when you have questions about a property or want to see it in person. Need some guidance picking out the best neighborhoods and homes? Based on your budget and criteria, we will help you locate the best properties and communities that meet your needs, wants, and goals. Did you know that our services are typically FREE to buyers? Once we find your perfect home, we will help you determine the home’s true market value, prepare the purchase offer for you, help you negotiate the best price and terms possible, guide you through all of the necessary paperwork and contracts, we will also help you select a home inspector and complete inspections, and guide you through the closing of escrow and transfer of title. Buying real estate can be a rewarding experience if done properly, or quite stressful if you are not prepared. By knowing what to do and preparing in advance, you can make your real estate dreams a reality while avoiding the possible pitfalls along the way. Here are some important steps to consider when buying a home or property. After deciding to buy vs. rent a home, your next step should be to find a real estate agent who will help you navigate the home buying process. Most expert real estate agents are members of the National Association of Realtors (NAR). If a real estate agent is not a member of NAR, you may want to look elsewhere. Your Realtor will ensure things go smoothly by avoiding common home buying mistakes. Since experienced Realtors have been involved in hundreds of real estate transactions, they know how to avoid the things that can turn your home buying dream into a nightmare. Your Realtor will know how to find the good neighborhoods and avoid the bad. They will help you to negotiate the best possible price on the right home in a good neighborhood. Your agent will also be able to provide you with a list of trusted resources and related professionals who can help you through the home buying process. As Award winning RE/MAX agents and ABR, BPOR, CDPE, CNE, CRS, GRI, PSA, SRS, REALTORs®, we at the YourOrlando.com Team are here and ready to meet with you. Please consider putting us to work for you. In most cases, the seller pays our fee so our service is FREE to you. You have nothing to lose and everything to gain. The second step is find a mortgage broker. As with finding a Realtor, having the right mortgage professional on your team is critical. So many times, we see buyers shop the internet for the lowest possible mortgage rate with almost no consideration for anything else. This can have disastrous consequences. Unscrupulous predatory lenders will use low rate bait-and-switch tactics to get you hooked. Once they get your application fee and have you hooked, the problems begin. The interest rate changes, phone calls are not returned, deadlines are missed—you get the idea. There aren’t many things more stressful than realizing that you have a mortgage person who either doesn’t care or doesn’t know what they are doing when you have a contractual deadline approaching. Your current bank, credit union, or a national lender is much better place to start searching for a mortgage. Your Realtor will do everything possible to ensure you find a lender who will be an asset to your home purchase team. Your Realtor will have a list of trusted mortgage professionals they have worked with in the past. Now that you have found your mortgage professional, it’s time to get pre-approved for your home loan. Your pre-approval will determine how much house you can afford and how much your payments will be. Completing this step will allow you to move swiftly with minimal stress when you find the perfect home—especially when there are other interested buyers competing for the same house. With your pre-approval in hand, you will only need to have an appraisal and survey on the property to complete the loan process. This will give you the freedom to focus on the home inspections once you find your dream home. It also indicates to the seller that you are serious, and that you really can afford to buy their home. NOTE: Ask Your Lender for a Good Faith Estimate (GFE). The Good Faith Estimate is a detailed estimate of your loan cost and what your mortgage payment will be. Your lender is required to provide you with a GFE within 3 days of making your formal loan application. PROOF OF FUNDS: If you are paying cash, ask your agent what will be acceptable as proof-of-funds. In the Orlando real estate market, we normally see a bank account statement from the account holding the funds. IMPORTANT: Make sure that you black out your account number on your proof-of-funds for security. Creating a wish list is one of the most fun and worthwhile steps in the home buying process. Your list of features that you need and want in your new home is invaluable. Without a thought-out plan as to what you need it is easy to get caught up in the moment and chase the prettiest home, without considering the things that may be more important in the long run like schools, community, parking, or other critical needs. You can refine your list as you begin to see homes. Now it’s time to pick out some actual homes to view in person. You will need to compile a list of properties with your Realtor. Your agent will send you listings, based on your “needs and wants.” From these properties, select the homes you want to view. Your agent will then set up the showing appointments. While you are viewing these homes, make sure that you refine your “needs and wants” list as you see things that you like or no longer want. Let your Realtor know if you see something you like or not. Doing this will help your agent find properties that are more compatible. Don’t be shy about expressing your dislikes when viewing a property. This will also help you agent zero in on what you want. If you walk into a house that you dislike immediately, don’t waste time, turn around and walk out. Your agent will appreciate your decisiveness. After touring each home, write down what you liked and didn’t. Develop a rating system or checklist that will help narrow down your potential homes. For example, pick the house you like best on day one and compare all other houses to it. When you find a better one, use the new favorite as the standard. Did you know that buying the most expensive home in a community is usually a bad idea? Your agent can point out features that help or hurt resale value. Once you’ve selected your your dream house, it’s time to get serious and submit a purchase offer. Your RE/MAX agent will be a invaluable resource at this stage since you and the seller have different goals. After your offer is accepted, you will need to complete a home inspection. It’s common to find problems, including leaky roofs, cracked walls, insect infestations and foundation problems. Your Realtor can help find a reputable inspector and will help you navigate the inspection process and how to deal with issues once the inspector’s report is final. If you negotiate repairs as part of the purchase, you will want to arrange for a re-inspection during the final walk-through inspection before closing of escrow and taking procession of the property. Ask your Realtor about home protection plans, which may save you money for problems that arise in the future. When you obtained your mortgage approval earlier in the home buying process, that approval was given subject to a satisfactory appraisal on the property you are purchasing. The lender requires this appraisal to ensure that their investment is covered in case the loan defaults. Your lender will study appraisals carefully to determine whether the property qualifies as security for the mortgage. If the property appraisal comes in below the sale price, the loan could be declined, or the buyer can cover the shortage, or the buyer and seller can split the difference. Your REALTOR will help you navigate any issues that come up during the appraisal process. The underwriting or final loan approval process can take anywhere from 1 to 3 business days. During underwriting the lender’s underwriter will look at your loan application and supporting documents to determine if the loan passes the lender’s qualification standards. If it does, a Clear to Close will be given. Once the Clear to Close is given, you are all set for your closing. Keep in mind, in most cases, the lender will have some clearing conditions that will need to be met before the Clear to Close is given. If you know about some of these things, be prepared to bring proof and other appropriate documents and information to the meeting with your mortgage lender. This can speed up the process considerably. When all of the closing conditions are cleared, a “Clear to Close” will be issued by the lender and the closing may be scheduled within a few days. The Clear to Close should be done a week before closing to prevent any delays. Before your closing date, make sure that you have the funds needed to close delivered to the title company. If your funds are not there, you will not be able to close. Keep in mind; many title companies no longer take cashier’s checks, so you will more than likely need to wire the funds to the title company prior to closing. 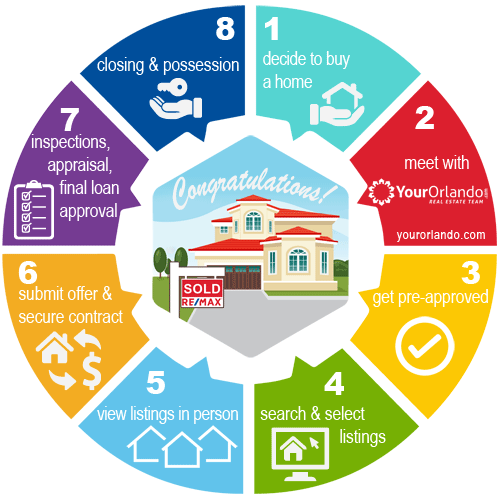 Are you buying a home in the Orlando area? There is a reason why our clients return to us repeatedly for their real estate buying needs. They are confident in our expertise. Not only to negotiate the best price possible, but to ensure the purchase process goes smoothly. We have gained our extensive knowledge of the Orlando real estate market through years of experience and superior training. The YourOrlando.com Team at RE/MAX meets the high standards of our elite affiliations with RE/MAX International, The National Association of Realtors, The Real Estate Buyer’s Council, Certified Distress Property Experts, The Council of Residential Specialist, The Realtor Institute, and more. As top RE/MAX Agents and Accredited Buyer’s Representative (ABR®), you won’t find better representation.